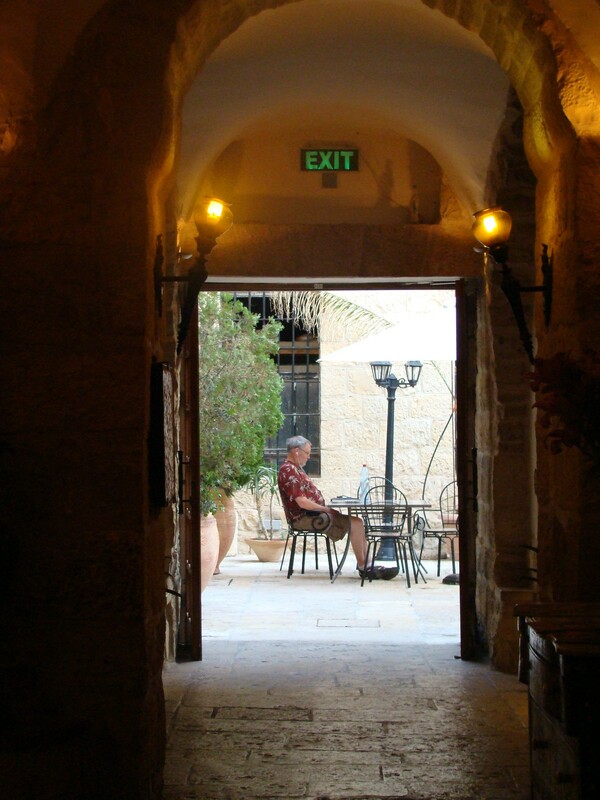 Tomorrow, Wednesday, September 2, the doors of St. Andrew the Apostle Church, Milford, Ohio, will open wide to anyone who would like to pray silently before the Blessed Sacrament for our family in Beit Jala (Bethlehem), West Bank, Palestine. 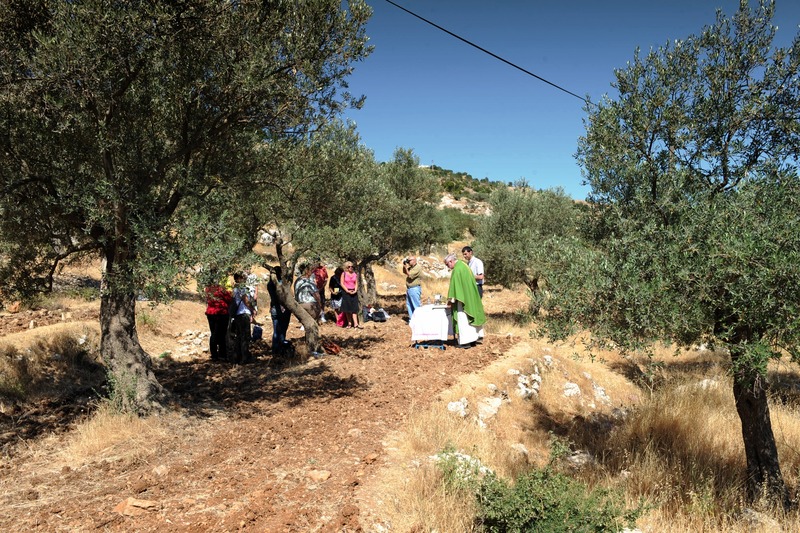 In June our pilgrim-teachers joined Father Ibrahim, the local parish priest of Beit Jala, for the every Friday afternoon Mass in an olive grove of the Cremisan valley. We prayed for a particular answer to a particular prayer: that the Israeli security wall not be built along the proposed route through the valley. 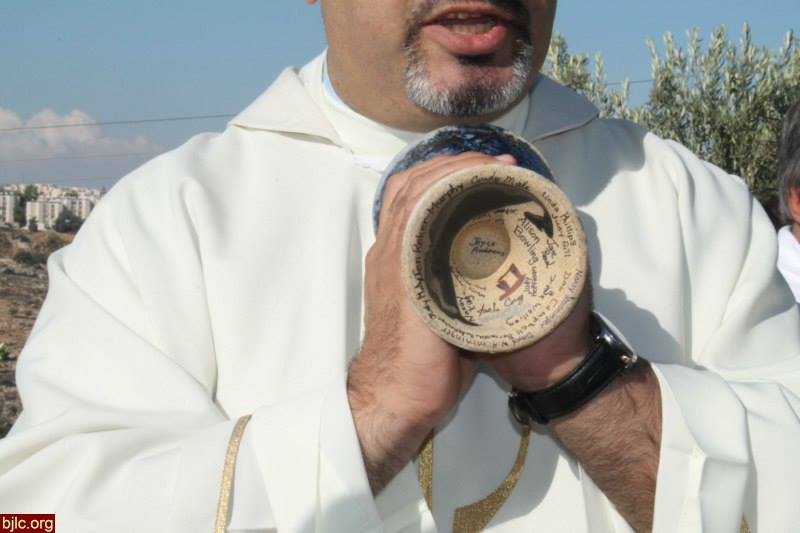 Father Ibrahim told the international visitors and the local people in attendance that the group of teachers that came from Cincinnati in 2012 brought a chalice with their names inscribed on the bottom as a gift to the parish of Beit Jala and as a sign of solidarity and continued prayers. Abouna (Arabic for Father) said that this chalice has been used every week since then. It was this chalice that I prepared for Mass with the wine and water. A court in Israel has heard the final arguments on the construction of a separation wall in the Cremisan valley of Beit Jala (West Bank). I found a link to this video, entitled “Israel plan to wall off West Bank land defied,” on the Facebook page of the Society of St. Yves Catholic Center for Human Rights, which is representing the landowners and the religious community of sisters of the Cremisan valley. 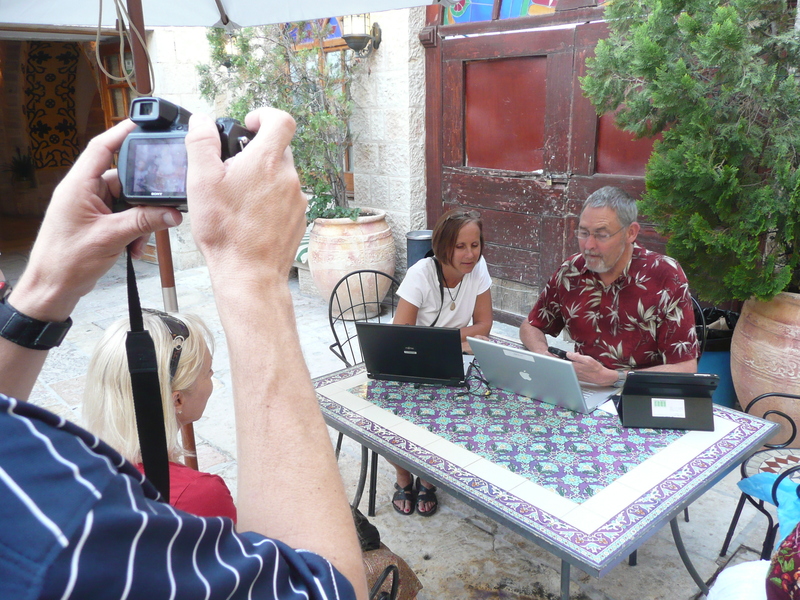 In the video at 1:12 and 1:33 you saw Father Ibrahim, the pastor of the Catholic parish of Beit Jala. 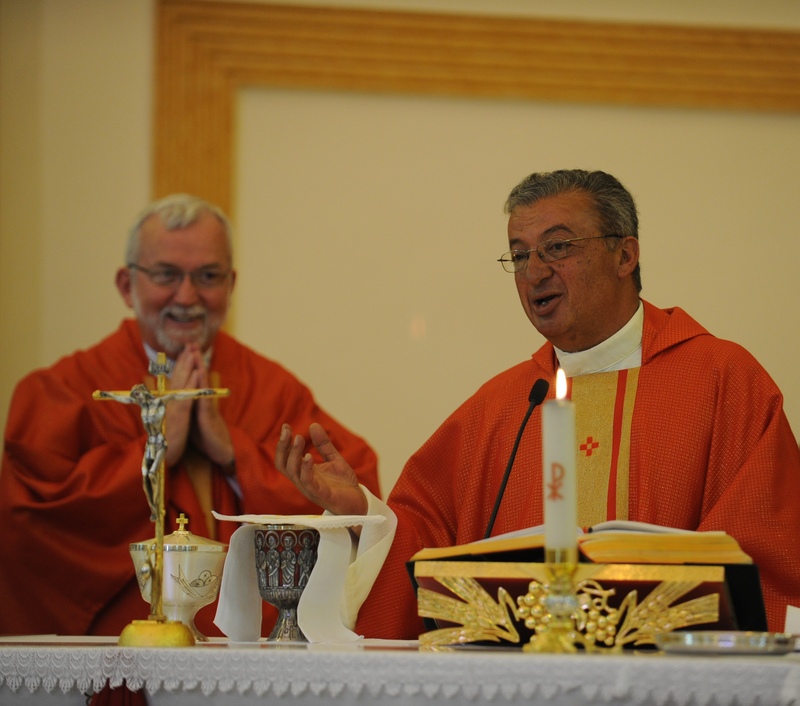 Father Ibrahim will be my guest at my parish in Milford in September-October, insha’Allah (God willing/hopefully). 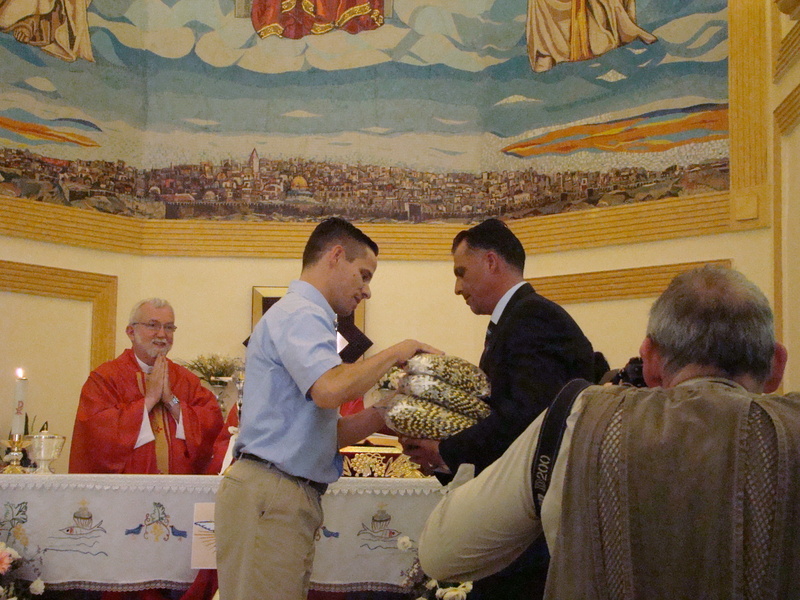 At 1:14 you saw the chalice that a group of pilgrim-teachers left with Father Ibrahim as a gift from us to his parish. 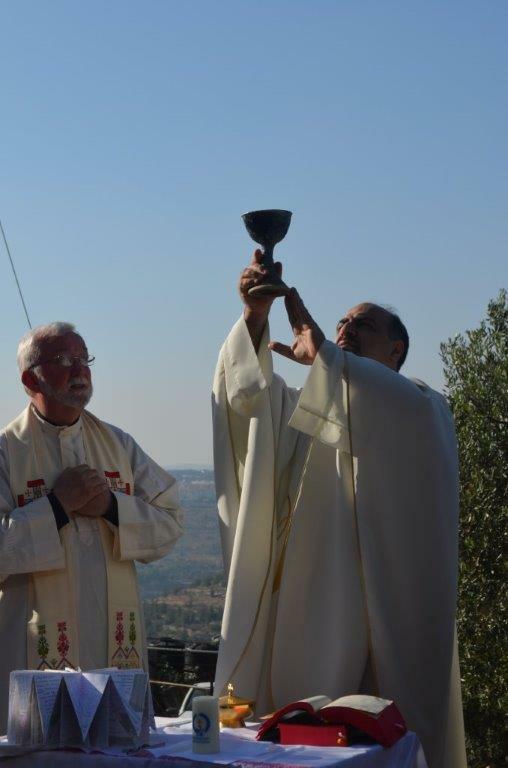 We used the chalice when we celebrated Mass in Cremisan valley. Father Ibrahim has used it every Friday since then, as he has celebated Mass in the same olive grove. 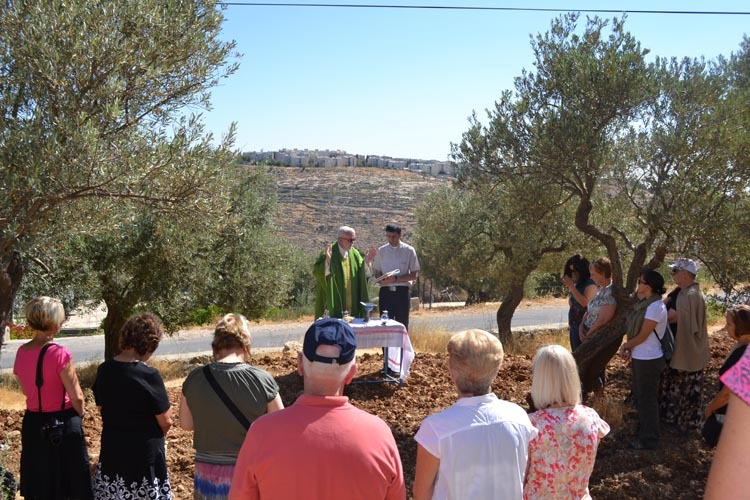 Mass has been celebrated in Cremisan valley every Friday afternoon at 3:30 p.m. in a prayer-protest of a proposed new section of what is called a separation wall by the Palestinians and a security fence by the Israelis. Whether it is for separation or security, it is definitely a wall, and not a fence, in this section of the structure that divides Beit Jala and Jerusalem. 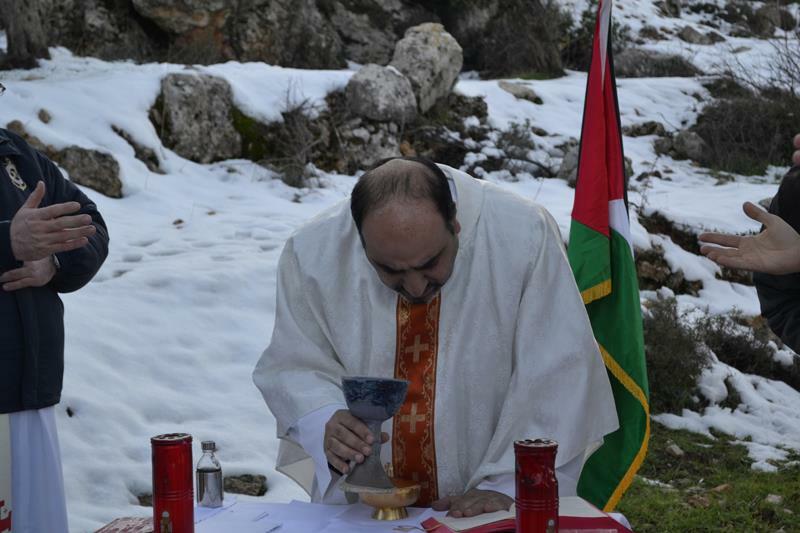 Earlier in January Father Ibrahim Shomali, the pastor of Annunciation Catholic Church in Beit Jala, celebrated the Mass in the cold and snow, after an unusual snowfall a couple days before. We see on the altar a blue-green pottery chalice. Father Shomali has used this chalice for the weekly Mass ever since June. We brought it from Cincinnati as a gift to him and the parish. 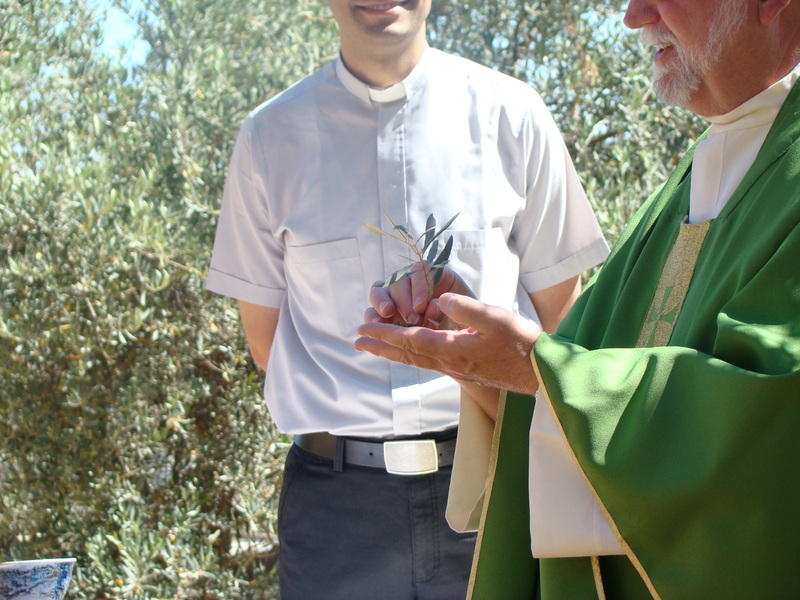 So, after we used it when we celebrated Mass in that olive grove in Cremisan valley on the edge of the town of Beit Jala in the Bethlehem-area, we left it behind, so that they might remember us in prayer as we remember them in prayer. 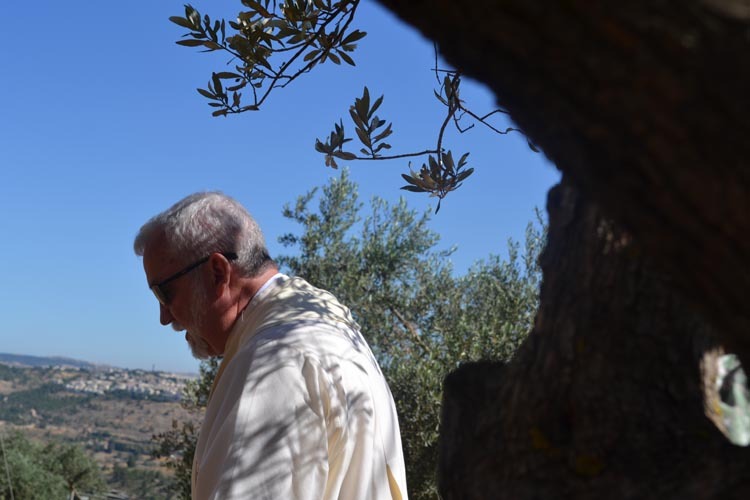 Today – Friday, February 8 – will be the last day that Father Shomali will celebrate Mass in that olive grove before the final decision of the Israeli government. A final decision of the Israeli Court will be handed down on February 12. Will Israel take control of the Cremisan valley? Or will the Cremisan valley remain in the hands of the Palestinians? PRAY. 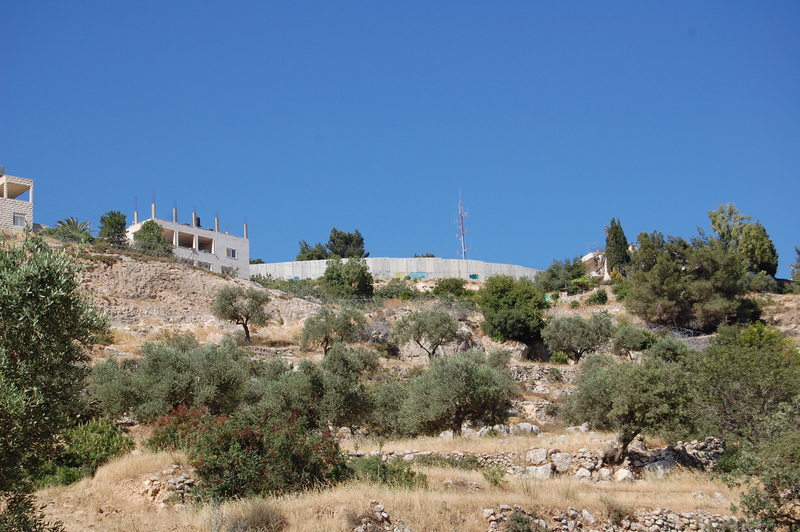 At 8:30 a.m.(Milford time) pray in solidarity with Father Ibrahim and the people of Beit Jala as they celebrate Mass at 3:30 p.m. (Beit Jala time). ACT. As urged by the United States Conference of Catholic Bishops, sign the petition that will be taken to Israeli authorities in protest of the proposed building of this section of the wall. Someone asked me what I most enjoyed recently about being Catholic – and – what concerned me most about the future of the Church. This is how I responded? How would you respond? Most enjoyed being Catholic? Being in the Middle East at Catholic Mass and having pilgrims tell me how much they appreciated the ritual of the Catholic Church and how comfortable they felt at Sunday Mass when the vernacular was not their own language. Because of the ritual, they could tell where they were in Mass and what was happening and was being said, even though they understood not a word of Arabic. One even noted that the priest, speaking Arabic, had the same inflection and cadence in his voice that his priest back home used when celebrating Mass in English. Most concerned about the future? That people and priests will become more and more imbedded in opposing camps, and will fail to take the humble stance and maintain the humble attitude to listen, to learn and to realize that the church does not belong to any of them. I fear that believers will feel so strongly about what they believe that they will always see things as simple and clear, that their first thought will be to try to control and convince the others, and that thus all conversation and growth will be stifled. The Society of St. Yves is the Catholic Center for Human Rights of the Latin Patriarchate (the Roman Catholic Archdiocese) in the Holy Land. The lawyers of this society have been arguing before the Israeli Supreme Court, at the request of the Latin Patriarchate, asking the Court to stop the Israeli government from building a new section of the security fence (separation wall) through the Cremisan valley at the edge of Beit Jala (Bethlehem). Our friends in Israel could clearly express their desire for reconciliation and security for all who live in the land by a decision NOT to build this section of the fence/wall in the Cremisan valley as it is proposed. Just think of the good public relations message that the Israeli government would put out and the good will that they would spread by making it known that they want the Christians to stay, that they want the people of Beit Jala to have a green space in which to rest and play, that they want the people of the area to have access to water, that they do not want the farmers to lose their livelihood, and that they want the children of the valley to feel safe and secure enough to live and learn as all children deserve – by making it known that they will NOT build that proposed wall/fence through the valley of Cremisan. The Israelis and the Israel government have an opportunity here that they do not often have to put their actions where their words are and their hearts where their minds are. An international audience would hear the message. Not building the wall/fence in the Cremisan Valley along the proposed route is a win-win situation for both the Israelis and the Palestinians, and especially for the children on both sides of that fence/wall that now divides them. 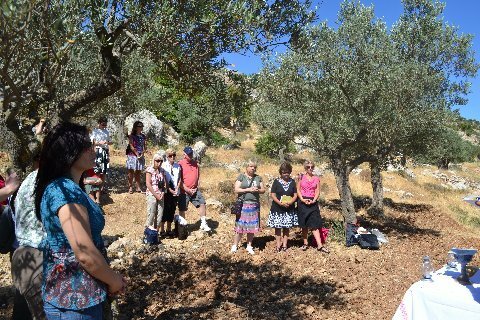 While on pilgrimage in the Holy Land in June 2012 with a group of teachers from various schools in our Archdiocese of Cincinnati we celebrated an outdoor Mass in Cremisan Valley in an olive grove. 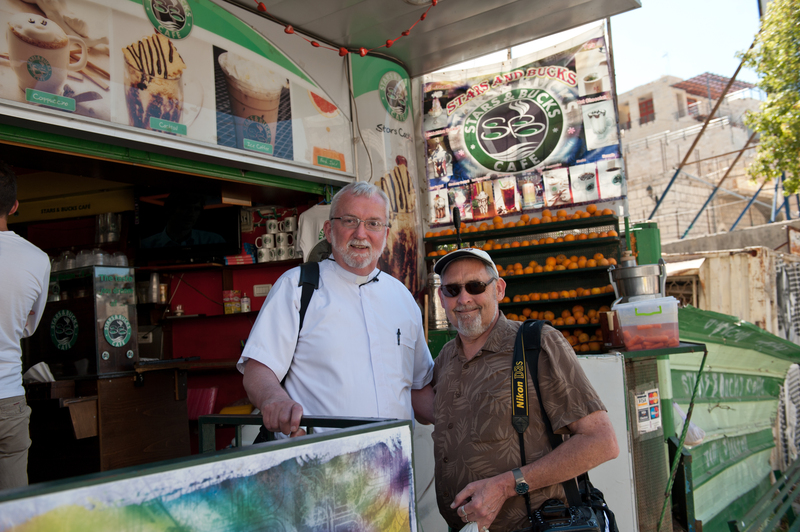 It was then that we met Deacon Sleiman (Solomon), a student at the Latin Patriarchate Seminary who is serving as deacon at Annunciation Church in Beit Jala. 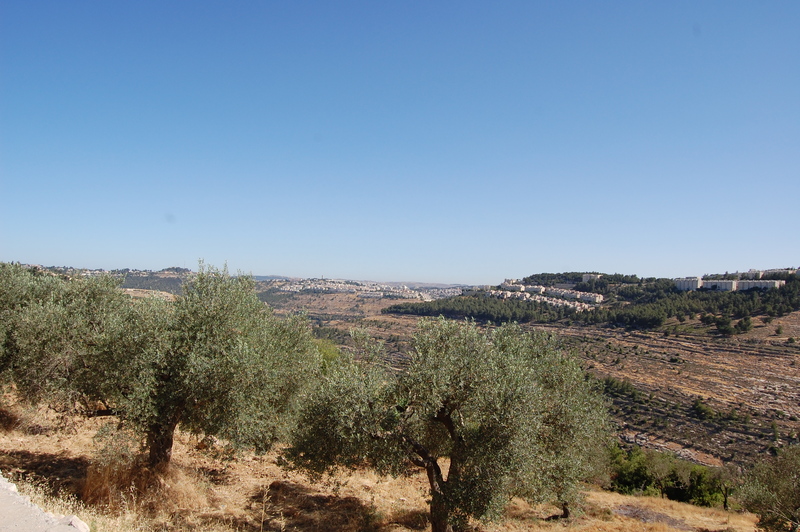 In his car Deacon Solomon led our bus on its way through the village of Beit Jala, up over the hill and around the winding roads, to the Cremisan Valley. In the open trunk of his car, he brought along an altar table, and inside the car he had everything we needed for Mass. He was the perfect host and gentleman. 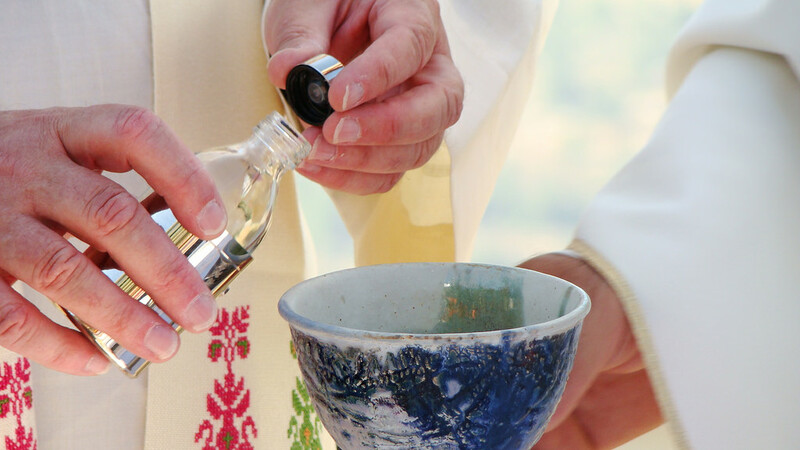 He is, in the words of one of our pilgrim-teachers, a holy man – and he will be a good and holy priest. Every Friday afternoon at 3:00 p.m., with obvious connections to the time of suffering that Jesus endured on the Friday that we call Good, Father Ibrahim Shomali, the parish priest of Beit Jala (Bethlehem) celebrates the Holy Sacrifice of the Mass with his people in an olive grove in Cremisan Valley on the outskirts of the town. This place is chosen by the parish of Beit Jala for Mass to protest in a prayerful and nonviolent way the proposed path that the Israeli government plans to follow in building another section of the separation wall through this very valley. What the Palestinians (and I) and many Israeli citizens call a separation wall, some proponents prefer to call a security fence, claiming that only 3% of it is actually a wall, and that the rest is a low lying, barbed wire structure. There is no doubt that this section will not be a fence; it will be a wall. 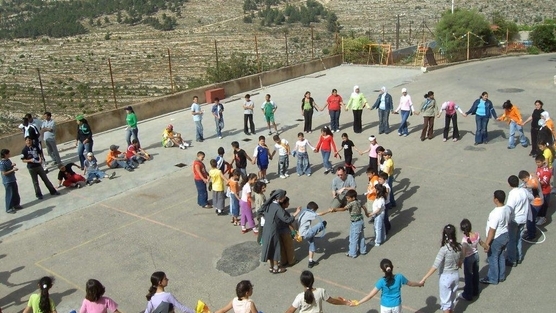 And it will separate: 58 families from their olive groves, 450 children from their school at the convent of the Silesian sisters, and all the people of Beit Jala from the only recreational park, green space that is left for them. And it is hard to imagine how this particular re-routing of the wall to take more land and water for Israel is necessary for security. The schedule for our pilgrim-teachers from schools of our Archdiocese of Cincinnati did not allow us to join him/them on Friday, so Father Ibrahim arranged for Deacon Suleiman to accompany us to the place for Mass on a Tuesday morning. 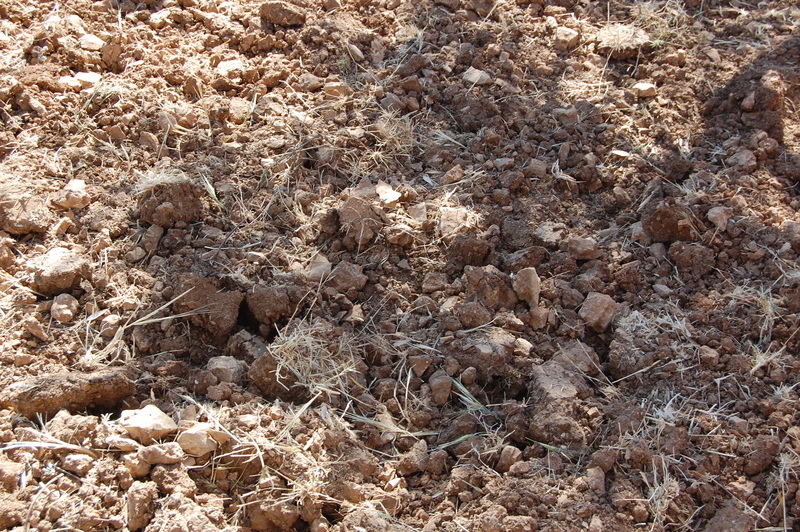 When we arrived, we found the ground turned up and over. Someone had obviously plowed the ground. It was alleged by some of the locals that the Israeli government had done that to make it difficult to pray there. No matter who did it or why it was done, the turned up ground did make it quite complicated to walk and difficult to stand, the slightest shift of our weight causing our feet to slip from underneath us. The situation made us more determined in our prayer. We stood our ground as best as we could. 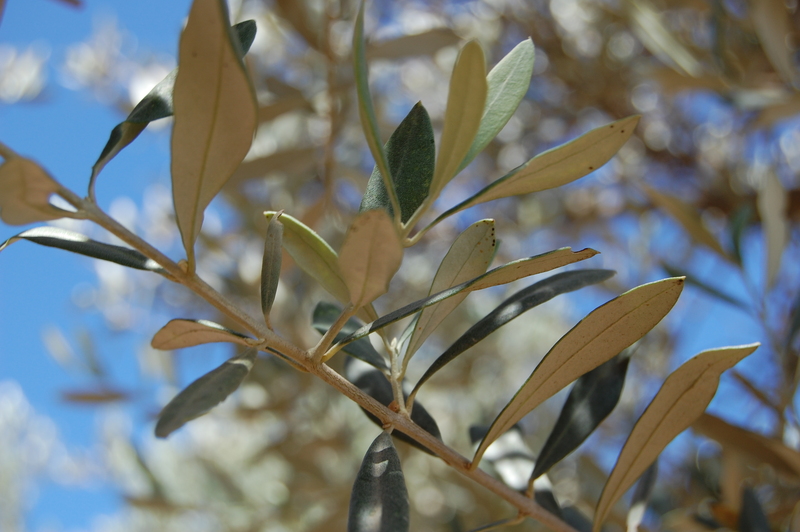 Deacon Suleiman called us to worship with a reminder that Jesus prayed on the night before his crucifixion in another grove of olive trees: at the base of the Mount of Olives in Jerusalem. 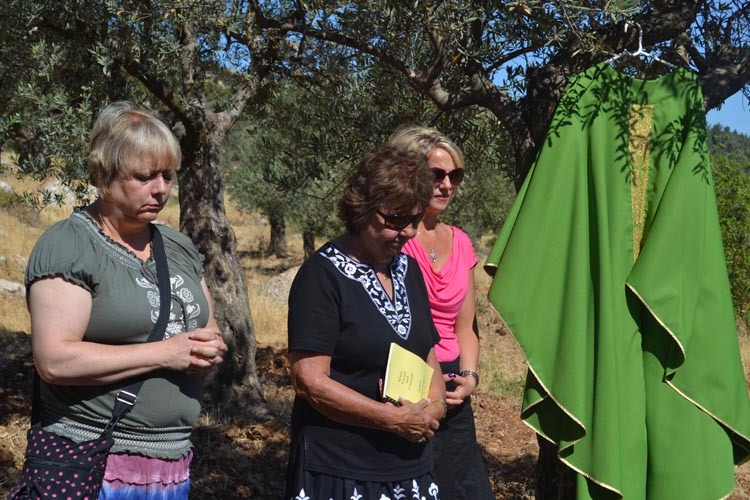 These olives trees are a Gethsemane of another kind. Here the agony of the garden continues. We prayed that the agony of our friends from Beit Jala will be eased. As we left, some of us picked up stones and olive branches, not knowing whether or not we will ever be able to return with them to this place. 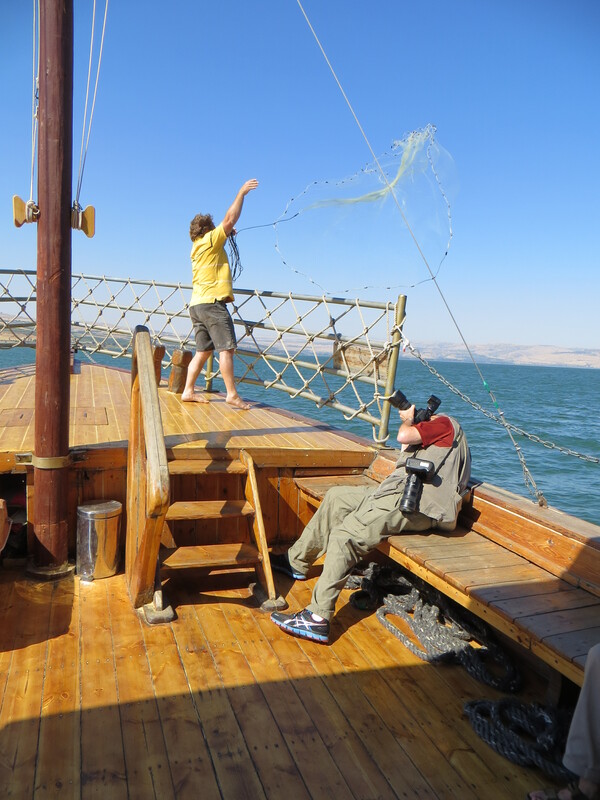 To say that he has the patience of a fisherman, the eyes of an artist and the precision of a surgeon might be a bit of a Middle Eastern overstatement, but he is a very good photographer. 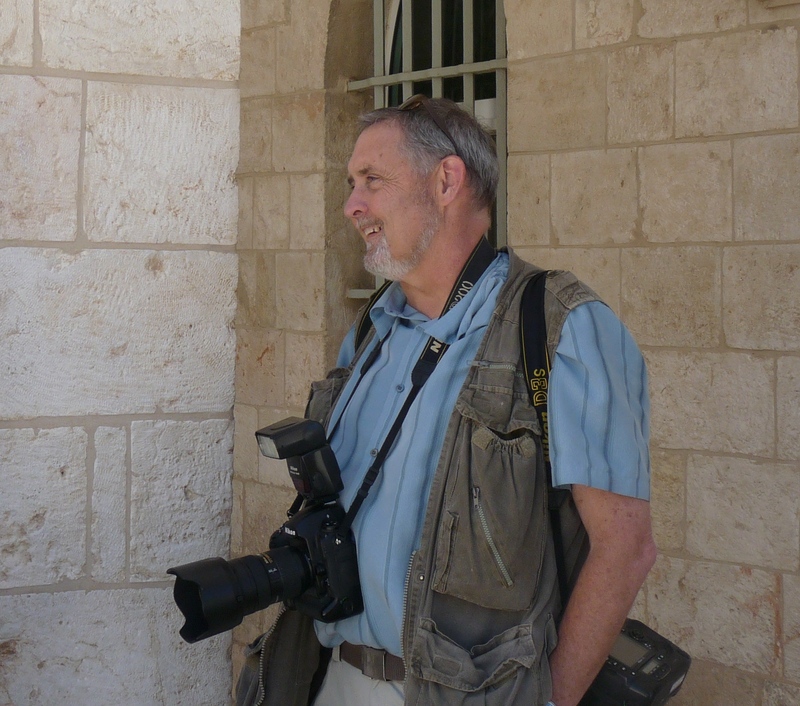 Mark Bowen accompanied the second group of HOPE pilgrim-teachers from Cincinnati to the Holy Land, having also been with the first group in 2010. Most often Mark is on the lens side of the camera. But once in a while he sets up the picture, turns his camera over to someone else, and is actually in the photo himself, like in this one taken by the café-keeper at Stars and Bucks in Bethlehem. 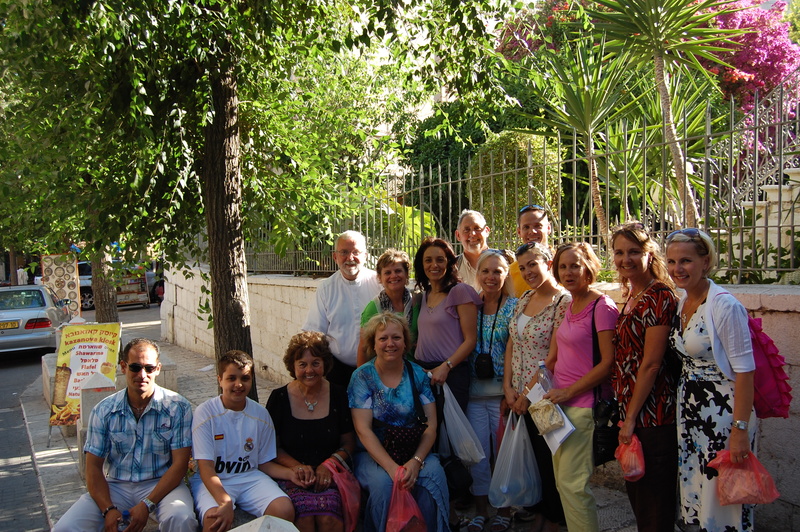 He was also coaxed into being in this group photo, taken in Nazareth by our guide Rami on Jen’s camera. 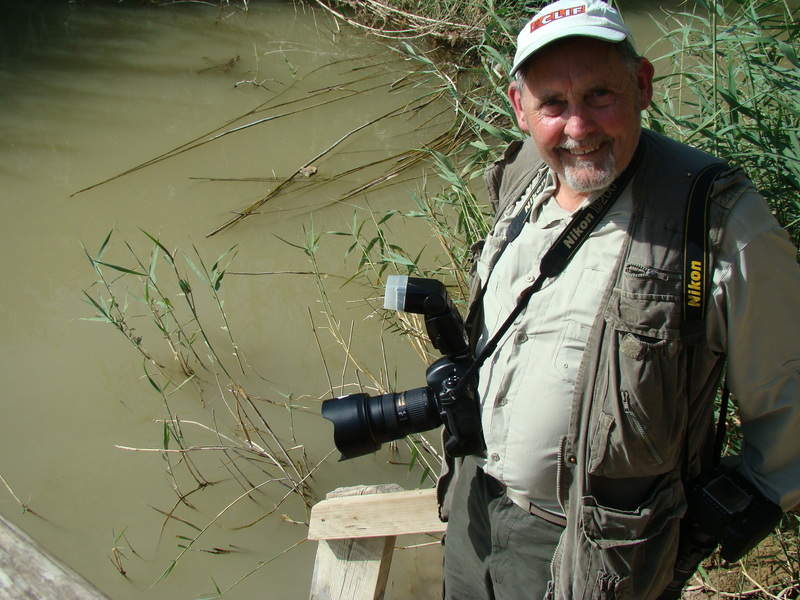 Being himself quite taken by an event or a site, he is even known to have allowed his picture to be taken by someone else with their own camera, like this one by JoAnne at the Jordan River. 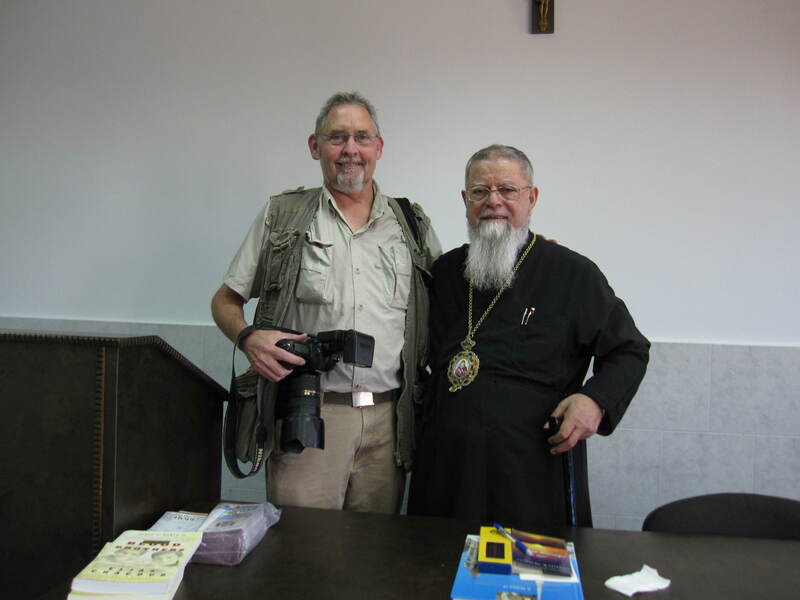 On a rare occasion, difficult to imagine but true, he has even “asked” someone else to use “his” camera to take his picture, like this one taken with Archbishop Elias Chacour at Mar Elias School in Nazareth. and in these two by Father Rob. 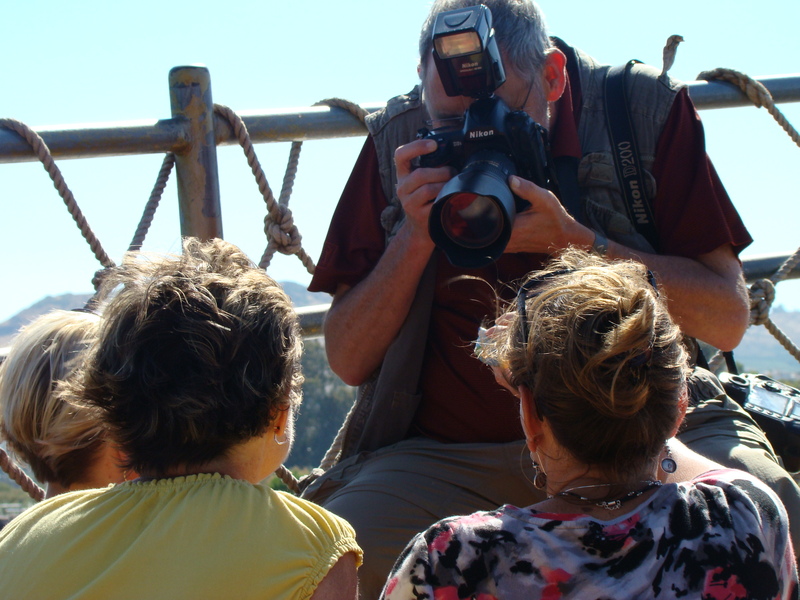 All that being shown and said, Mark has done a remarkable service and a remarkably good job of capturing the moments, the people, the emotions and the HOPEs of our Cincinnati teacher-pilgrims and our Palestinian teacher-friends during the HOPE Pilgrimage 2012. Acknowledging Mark’s work on the back end of so many photos and memories, on the front end we all want to express to him our gratitude, appreciation and admiration. 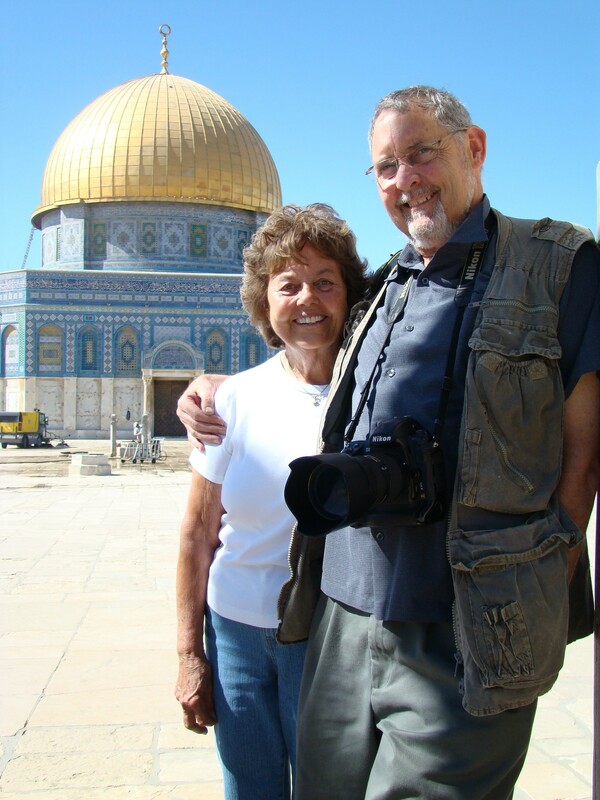 By the way, Mark, “Mom” (Nancy) especially wants you to know how much she loves you, as can be seen on her face (and yours) in this photo of the two of you, taken by JoAnne at the Dome of the Rock. The views expressed on this blog are mine alone and do not necessarily reflect the views of St. Andrew parish or the Archdiocese of Cincinnati.